The Land of Fire is brimming with incredible castles, palaces, and cities making a true impression of fairy-tales. Every corner, every stone of this fantastic destination represents a valuable history. A splendid country with its historical museums and extensive parks makes you feel like you are in a fantasy world. A single tree alone is a majestic thing, but a throng of them together growing in the wild transforms this place into a wonderland. Although a number of mysterious and spectacular sights are still waiting to be discovered. Some of these sites are challenging to get to; others are busy tourist destinations. 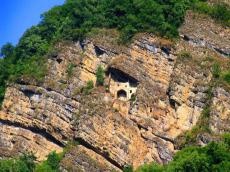 Perigala is considered to be one of Azerbaijan's lesser-known archeological treasures and historical mysteries. I bet that you have never seen anything as charming as this town before. This mysterious structure built in the cliffside some 300 meters above the ground is located near the village of Chardaghlar, Zagatala region. The limestone structure with three rooms most likely was built between the 4th and 5th century AD, during the reign of the Sasanian dynasty. Unlike other towers, Perigala is a monument erected on a high rock. The site includes a forty-meter stairway reinforced with oak beams and also a covered walkway. Located in a remote part of Azerbaijan, it requires much effort to access. "Once young people knew how to get into the fortress. As a sign, they hung out a white flag or white cloth out the window of the fortress. There were also stairs in the monument, but now they are completely destroyed," said the historian Mohammed Gadzhiakhmedov while talking to sputnik.az. Some historians believe that Perigala was built at the times of Timur, historically known as Tamerlane. "The village itself was named after the fortress. The word Chardag means the temple built in the rock," said Gadzhiakhmedov. Also known as the Fairy Castle, the fortress is shrouded in a set of many legends. Once upon the time a beautiful woman named Peri became the focus of a Mongol warlord who requested permission of her father that she join his harem. However, she had other plans. Peri leaped from her castle and crashed onto the rocks below. The tale which bears some similarity to the story of Baku's Maiden Tower.